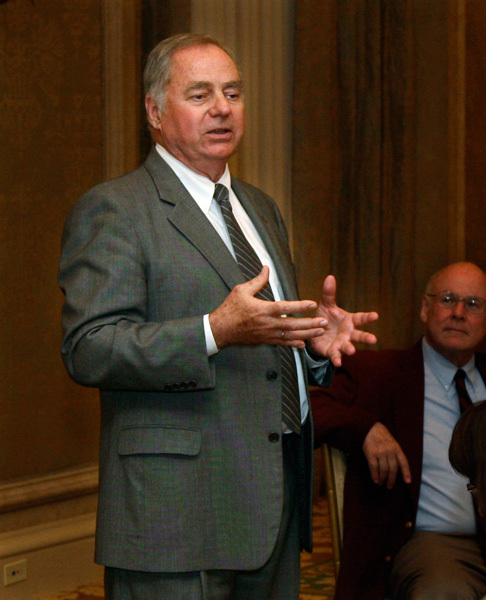 At their April 17, 2008 meeting, members of the Dean’s Advisory Council for the Texas A&M College of Architecture, surprised Tom Regan, dean of the college, by establishing the J. Thomas Regan Interdisciplinary Faculty Prize, an endowed award that when fully funded will honor in perpetuity Regan’s decade of outstanding leadership of the college. The prize, begun with a $40,000 gift from advisory council members, recognizes Regan’s legacy of building interdisciplinary opportunities for college students and faculty. It will be awarded annually to a College of Architecture faculty member who has demonstrated a commitment to interdisciplinary teaching and/or research in the built or virtual environment disciplines. Regan joined the Texas A&M faculty in 1998 as dean of the College of Architecture. During his tenure, the college became the largest college of its kind, with one of the most advanced research agendas of any U.S. architecture school. As dean, Regan greatly expanded the global influence of the college and promoted interdisciplinary collaboration in research and education between faculty in the college’s four departments. He promoted international study and research as a catalyst for global collaboration in issues related to the built and virtual environments in both education and professional practice. Prior to this appointment, he served as dean of architecture colleges at three major universities — Auburn University, North Carolina State University and the University of Miami. In 2008, the Design Futures Council named Regan as one of the 25 most admired educators in the United States. The honor resulted from a nationwide survey of architectural firm leaders. Anyone interested in contributing to the J. Thomas Regan Interdisciplinary Faculty Prize is urged to contact Larry Zuber, senior director of development, at l-zuber@tamu.edu or 979.845.0939.
being voted off "American Idol"